While Amateur Radio might not make the headlines everyday, we got a mention in the White House report on Hurrican Katrina. The report was very self critical on the government's role in handling the aftermath of one of the worst natural disasters in our Nation's history. 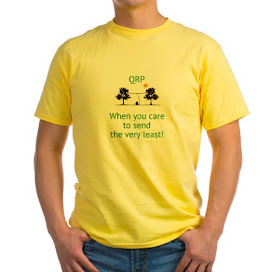 Amateur Radio was mentioned in a very positive light. At least we're getting noticed somewhere! 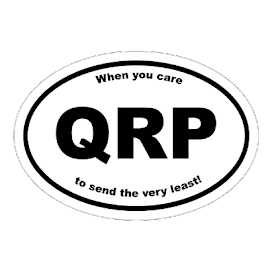 The following appeared courtesy of Rich Moseson W2VU, editor of CQ Magazine, on the CQ Magazine e-mail reflector. Thanks, Rich, for keeping us informed! first day of the 2006 hurricane season. calls and rerouted emergency requests for assistance throughout the U.S.
Waterway Net, Skywarn and the Salvation Army Team Emergency Radio Network." 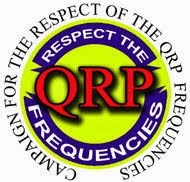 preparing for and responding to natural and man-made disasters;"
Element 1 (5 WPM) Morse code requirement for all license classes. be no ''big announcements'' at the Dayton Hamvention FCC Forum either. Service licensing rules or operating privileges. applicants--into a single proceeding designated WT 05-235.
changes in CW allocations or privileges. No ..... not the Cooties; just a Cootie. And this Cootie has nothing to do with imaginary childhood pretend diseases. When I joined the SKCC and started using the straight key on a continued basis, my elbow and arm let me know in no uncertain terms that it was objecting mightily! The prolonged up and down motion was creating a repetetive stress disorder. So I sold a couple of military jet models on eBay. These were sitting around collecting dust; and in the process, I earned enough cash to purchase an LTA Cootie Key from Marshall Emm, N1FN at MorseXpress. The Cootie Key, or sideswiper as it is also known, does just that. 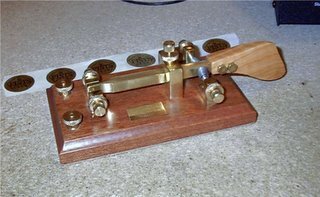 It allows you to send Morse Code by swinging the lever from side to side; instead of pumping it up and down. You make contact on each side of the swing; so it's more like using two straight keys back to back and then laying them on their sides. I thought that it was going to take a real long time to get used to it; but fortunately, that hasn't been the case. I guess all those years of using a keyer and paddles has helped. The hardest thing to get used to is that you're making these dits and dahs manually. 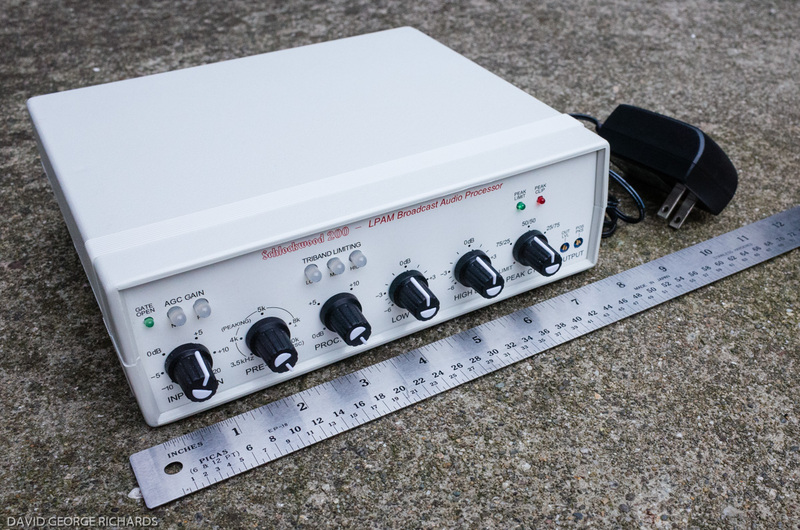 The temptation is always there to let your "keyer" make you either a string of dits and dahs. I have to constantly remnd myself that there is no keyer and that I have to break contact in order to make more dits and dahs. 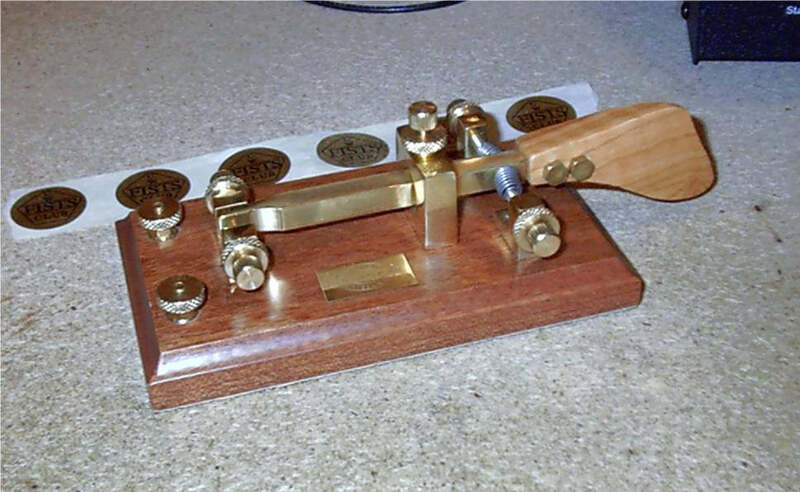 After about a week's worth of practice off the air; I have ventured towards using this beautiful key on the air in realtime QSOs. I must be doing okay as no one has called me a "lousy fist" yet; and everyone seems to understand what it is that I'm trying to say. In any event, practice makes perfect and I'm sure I'll get better and better the more I use it. I am embarking on a restoration project; which I don't believe is going to prove to be too difficult. To the left is a Vibroplex bug that I won in an auction on eBay. I got it at the great price of $31.00. Considering the fact that the average Vibrpolex bug goes for well over $100.00 on eBay, I think I got a real good deal. 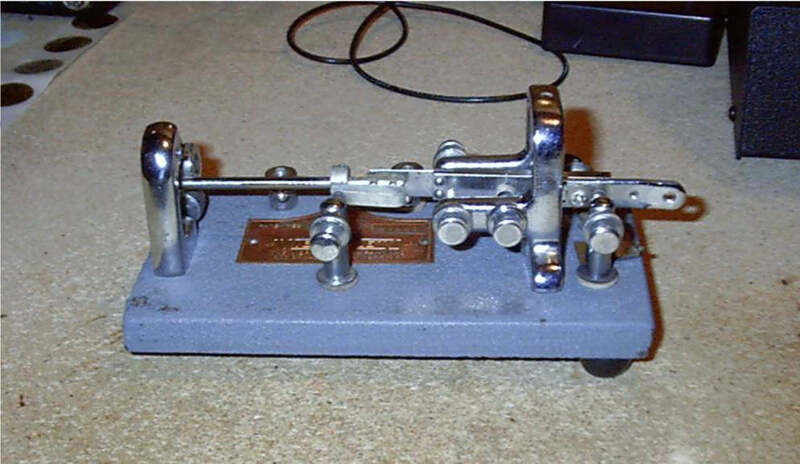 This one is a Vibroplex Standard Original. The serial number dates its manufacture in 1957. That's cool; because this makes this bug as old as me! In any event, this bad boy has a few problems right from the get go. There are no weights on the pendulum; and there was only one finger piece on it when I got it. The picture above shows that I have taken that off. The hole that the finger piece screws into was cross-threaded so I am going to have to retap the hole. 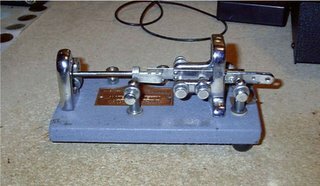 A telephone call to Vibroplex was in order; so I placed an order for two new black finger pieces as well as one heavy and one medium weight. I think this bug was stored somewhere where the humidity is high. A look at the strap underneath shows some heavy oxidation; which can lead to intermittant operation. The strap will have to come off and get polished by the Dremel tool. While I'm at it, the rest of the metal pieces will receive a light buffing from the Dremel, too. The base will receive a gentle going over with a Mr. Clean Magic Eraser. That should get this beauty back in fine business shape! And once it's operational, I am looking forward to the challenge of matering the use of a "speed key". It has been said that the history of Amateur Radio has time and time again displayed the resourcefulness of Amateur Radio operators. In 2006 Hams are taking this reputation to the next level! Tomorrow, February 3rd is scheduled to be the launch date for SuitSat. 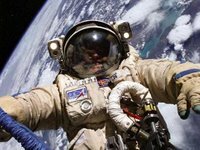 The Ham Radio ops who are currently assigned to and are living aboard the International Space Station will be making use of an old, worn out Russian space suit. They are filling it with various bits of Kenwood 2 Meter amateur radio gear; and they will be setting it free to float in orbit on its own. The EVA when this is supposed to happen is scheduled for tomorrow; and if all goes well, then SuitSat (as it has become to be known) will be born. The suit will be under no kind of propelled orbit. It will just be free floating, orbiting around the earth under the influences of orbital and gravitational laws. The batteries that will be powering the equipment are expected to last about six weeks. The suit will be sending out a beacon message; and if the suit is orbiting over your area at a sufficient elevation above the horizon, you should be able to hear the message with an ordinary 2 Meter handheld tuned to 145.990 MHz. Happy monitoring and good luck! Who knows, this might get you interested in working the various OSCAR satellites that we have up in space. I've done it; and it's a ton of fun!